The Happy Feet Slippers is coming to the Shark Tank with a collection of products second to none, when it comes to the most comfortable looking foot wear ever seen on the Show. When I first seen the Happy Feet Animal Slippers for the first time, oddly enough my first impression was to compare these overgrown fuzzy slippers to the Ugg's that made overgrown foot wear fashionable, but with a lot more fun and exciting colors. It looks like these Happy Feet Fuzzy Slippers invented by Pat Yates, from Louisville, Kentuckyhas been on the market since 1996 mostly selling in Mall Kiosks. An 18 year old business may seem like an eternity as far as the Sharks are concerned, but once they try on a pair of these colorful overgrown slippers, they're sure to have Very Happy Feet a lot of customers reviews say it's like walking on pillows. Another positive Happy Feet Slippers has going for them is the sheer number of products already for sale. There's over 450 versions of the Happy Feet Slippers on Amazon alone which just might be a new Shark Tank Record for the biggest selection of products already sold online. Until recently,(or at least before this Episode 519 of the Shark Tank airs) the majority of sales still come from Mall Kiosks set-up around the country and run by entrepreneurs who are taking advantage of this unique business opportunity helping everyone have Happy Feet. It also looks like Pat Yates, and the Happy Feet Slippers have already profited from being seen on a Reality TV Show. The highest paid actress on the Jersey Shore Show on MTV, Nichole Polizi, AKA Snooki, liked her overgrown colorful slippers so much, she stared wearing them during the Show. Pat go a hold of Snooki first to thank her for all the great free publicity she was giving Happy Feet, then to see if she might be interested in designing her own line of plush animal slippers. 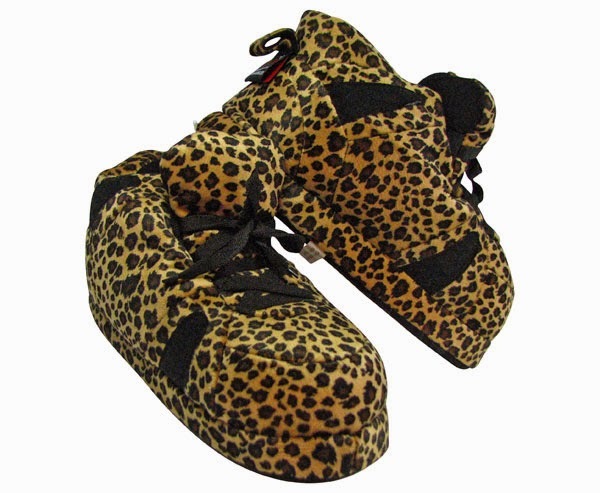 Snooki gladly accepted Yates offer, and now has incorporated her footwear designs into a growing list of products for her own Brand. How much does it cost to get the highest paid actress on a successful reality show to help promote your business? I couldn't find any information on their business arrangement, but hopefully this will be brought up on the Shark Tank and see if Snooki is now a business partner with an equity stake in its success. In the previews of this Episode 519, we already know there will be a big battle inside the Shark Tank with the Shark-etts Barbara Corcoran and Lori Greiner, teaming up on a deal against the male Sharks Mark Cuban, Kevin O'Leary and Robert Herjevic. 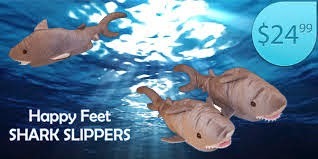 Snooki Slippers made by "Happy Feet"
Remember, this Special Episode of the Shark Tank has been moved up to Thursday April 10, 2014, which is a first for the Show in this time slot. ABC will also have another Brand New Episode in the regular time slot the next day on Friday April 11, 2014, so start getting ready for a double dose of the Best Business Reality Show ever seen on TV. Where are "Happy Feet" slippers made?